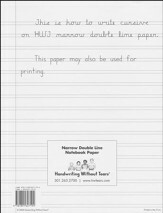 Handwriting without Tears aims to make legible and fluent handwriting an automatic, mastered skill. 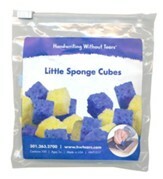 Simple for home educators to use, lessons take only 15 minutes a day. The main objective for students is to achieve goals, not to finish a set number of pages. This fourth grade kit is designed for children in the fourth grade or functioning at that level. This curriculum is perfect for children who need to review the formation of lowercase cursive letters, work on the connections between cursive letters, and need to develop fluency in cursive writing. The Cursive Success Student Workbook provides the examples, practices, and exercises for the Handwriting without Tears' 4th Grade student. The portrait-orientation of the paper emphasizes practice with smaller size writing, while the last third of the book gently helps transition students to single lines. 94 pages. The 4th grade Teacher's Guide provides tips and lesson plans to teach handwriting, posture, paper skills, letter skills, word skills, and sentence skills through imitation, copying and independent writing. There's plenty of information on how to prepare for lessons, stages of learning, instructional stages, a scope & sequence, posture, grip, spacing, and other helpful hints. Lessons include scripted questions, reproductions of reduced-size student pages, multisensory activities, finger trace and check models with instructions, page numbers, word lists, and more. 174 pages, softcover. The Double Line Paper solves the problem of line confusion. The bottom line keeps the writing straight and the midline controls the size of the letters. Lines are spaced 2/16" apart. Teach your students letter formations and placement of letters on double lines with hands-on blackboard activities. Measures 10" x 17". 4th Grade Cursive Teacher's Guide, 174 pages, softcover. Updated Edition. Cursive Success student workbook, 94 pages, softcover. Updated Edition. 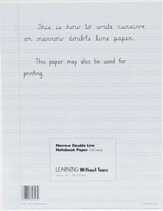 Narrow Rule Double Line Paper, 100 sheets. Blackboard with Double Lines, 10" x 17". Now aligned to Common Core State Standards in English, Language Arts, and Math, this new edition makes it easier to integrate handwriting into your curriculum. In the new teacher's guides, applied writing activities provide additional lesson ideas, and home links provide strong school-home connections. Expanded teacher guidelines are also provided. The student workbooks provide new features to benefit your child, including lessons that now integrate cross-curricular connections. The Handwriting without Tears Cursive Success curriculum is a Grade 4 handwriting program designed to be intuitive, engaging, and developmentally progressive. Lessons take approximately 15 minutes per day and teach cursive handwriting through a variety of multisensory and writing-based activities. Lessons are easy-to-use and include objectives, a lesson introduction, the student workbook page number, QR codes for multimedia elements, reduced-size student pages, and a detailed lesson plan with enrichment, support/ELL notes, and cross-curricular connections at the bottom. The back of the book includes a section with detailed instructions for the multisensory activities. This curriculum can be supplemented with the Magic C Bunny, blackboard with double lines, cursive wall cards & cursive alphabet desk strips, and narrow double-line notebook paper (all sold-separately). This new edition features updated lesson plans with a streamlined lesson design, simplified teaching guidelines, cross-curricular and school-to-home connections, and optional digital augmentation offerings. Students receive more opportunities for writing practice, and seamless teaching that includes modeling, writing, and music. The online resources referenced throughout are available to homeschoolers; you will be directed to a login page where you'll create a free account. This account provides a 30-day free trial of the full digital experience, which is designed with features for classroom teachers using digital whiteboards. After the trial ends, only the "A Click Away" resources are available, which are all that homeschoolers should need to supplement the program. This student workbook is part of the Handwriting without Tears Blue Level E/Grade 4 "Cursive Success" level. The activity pages promote fluency with more advanced language arts activities; in addition, review & mastery pages help children review letters and connections and work on truly mastering cursive. Students will copy paragraphs and poetry in addition to individual letters and words. This new edition features expanded room for writing and integrated digital instruction opportunities. This workbook is designed to be used alongside the Cursive Success Teacher's Guide (not included and sold-separately), which contains the lessons and directions. 94 pages, softcover. Page are reproducible for a single child only; copies cannot be made for children other than the child for whom the workbook was purchased. This journal is designed to be used with the Handwriting without Tears Blue Level E/Grade 4 "Cursive Success" resources. This journal is appropriate for fourth grade students and provides a place for strengthening handwriting and creative writing skills during independent writing time. It features narrow double lines - great for copying or journal writing! 80 pages, paperback.